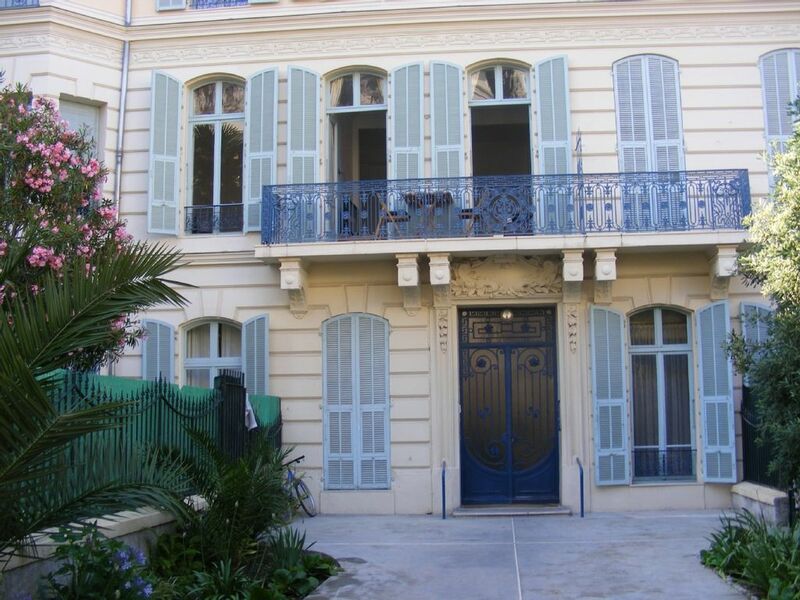 Nice apartment with balcony overlooking 2 gardens in quiet traffic free street. The bathroom has a large walk in shower as well as toilet and wash hand basin. There is a ceiling fan in the living area and a portable fan for either the bedroom or the living room to assist in your comfort. Large kitchen island that has dining seating for 2 people. A very pleasant apartment that provides comfortable accommodation and a convenient base to explore places in Nice and other close by places in the French Riviera. The lively promenade, beach, a variety of restaurants, shops, outdoor markets as well as transport links were all within walking distance etc. The owner Gary sent us useful notes on airport transport, places to see etc. which came in handy. We took late night walks to the promenade / beach / shops and restaurants with a child and felt no particular concerns over security in the neighborhood at the time of our visit. All in all accommodation was comfortable and provided all we needed for our stay and would stay again when we go back to Nice. Don't stay here in the hot summer months! This apartment is quite spacious and well equipped at first glance. It is very near the railway station so handy for taking lthe train to visit places. However, it is at the edge of the more undesirable area around the railway station and is a good 15 minute walk from the seafront. The apartment building is very old and needs some maintenance outside. It was fairly quiet but security wasn't very good as the gates were permanently chained open, so that the security code wasn't being used. The front door was often left open by residents too. The apartment had maintenance issues too. The freezing compartment door in the fridge was broken so the compartment was all iced up, the sink plug was broken so you had to wash dishes under running water. Luckily the dishwasher worked so we used that instead. There was a nice walk in shower but it was difficult to regulate the water temperature. There was a 2 foot hole in the wall where pipes were boxed in, there was a loose floor tile in the kitchen area and the windows were hard to open. On the plus side, the bed was very comfortable and the flat was clean. The dreadful aspect is that the temperature was 32 C in the flat the whole time. This flat is advertised as having fans and a portable air conditioning unit. This air conditioning unit leaked lots of water all the time and could damage the parquet flooring. When I asked the owner about this he said it came from the UK and had never really worked properly. He advised using it as a fan only. He said this is why he doesn't advertise that the flat has air conditioning! I will repeat that this flat is advertised as having air conditioning!. We were so hot in the apartment that it was almost unbearable. When we tried having the windows open with the shutters shut at night to cool down the flat we got bitten by mosquitos even with plug in repellents. All in all, this situation spoiled our holiday. The flat is quite cheap to rent, fairly well equipped and may be a fairly good budget option in cooler weather, but don't bother in the summer. We had a water leek earlier in 2018. This involved scaffolding and replacing ceilings etc. All work has now been completed by the building management factors. Close to the train station and a hop, skip and jump to the tram. Can walk pretty well everywhere. Generally a quiet safe feeling neighbourhood. Many small, unique restaurants 2 minutes away. The flat was comfortable, spacious and clean with modern conveniences. Would recommend this property. The manager was also very efficient and helpful. Quiet but not out of the way. Location perfect as 10 minute walk away from the busy promenade making it quiet & relaxing after a busy day. Very short walk from the train station so good for exploring the different locations. Plenty of very nice restaraunts. The apartment was perfect for our stay with the small but useful kitchen area and open lounge, bathroom had a lovely large walkin shower. Gary was very responsive to any questions I had on where to visit & directions from airport were perfect. As advertised. Spacious, fine location. Convenient to transport,eats, etc. Agent responded quickly and usefully to one unforeseeable circumstance. Comfortable home base for exploring Nice and the Riviera. The lovely second-floor apartment is a 10-minute walk from the sea and within five minutes of groceries, butcher shops, produce markets and bakeries. The neighbors are considerate and friendly. The apartment is a perfect home base for exploring Nice and the wonderful French Rivera. The bars and restaurants are located within a 5 min walk on the traffic free Rue de France or 10 mins to the old town. Both areas have excellent bars and restaurants. Around the corner is the tree lined Boulevard Victor Hugo where the Holiday Inn & Malmison hotels are. The property is perfectly situated within a 5 minute walk to the main train station. This allows you to exploring the towns around Nice being Cannes, Antibes, Monaco, Menton, Beaulieu, Villefrance or the Friday market in Italy. The tram is a 5 mins walk away and for a 1 euro ticket this can be re-used for bus travel to Monaco, Cannes, Grasse, Vence or Eze. The promenade de anglas and beach are 15 mins walk away where you can sunbath or go swimming. There is a water park near Antibes and the port of Nice has scuba diving and sailing. You can also take a ferry to Corsica or charter a luxury yacht. If you would rather shop there is a shopping mall 5 mins away on Avenue Jean Medecin and all the designer shops you need. Location - access to the apartment complex is on the lane to the right hand side of the building, there you will find an iron gate with a keypad please enter the code 3147E and push the gate hard as it sometimes jams in hot weather.